It was on the Feast of the Immaculate Conception (then celebrated on December 9th) that Our Lady of Guadalupe, patroness of the Americas and the unborn, first appeared to St. Juan Diego. The National Night of Prayer for Life bridges these two feasts to honor Our Blessed Mother and to pray for the sanctity of all human life. 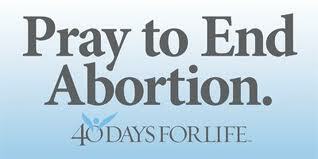 The year 2010 will marked the 21st annual National Night of Prayer for Life to take place from 9pm, Dec. 8th to 1am, Dec. 9th. Members of HELP joined in St. Helen's participation with an hour of Adoration and Benediction after the 7:30 pm Mass on Dec. 8th to pray for the children who were never born. Ten members of HELP traveled over the river and through the woods December 4, 2010 to Immaculate Conception Church in Willoughby, Ohio, for Adoration of the Blessed Sacrament and to hear Father Frank Pavone of Priests for Life. 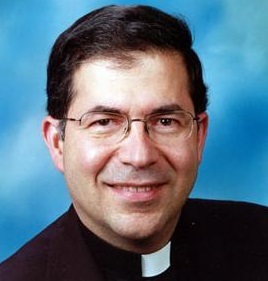 Speaking without a teleprompter or even notes, Father Pavone told about the beginnings of the abortion industry, the activities of Priests for Life, and what needs to be done to bring an end to the culture of death. At the social gathering afterwards, Father Pavone and his assistant, Jerry Horn, offered incite, advice and encouragement to continue effectively growing our pro-life efforts. We went out into the wintry night newly invigorated. At the requests of Pope Benedict XVI and our Bishop Richard Lennon, St. Helen's Church joined Catholics throughout the world in celebrating a Vigil for Nascent Human Life on November 27th in conjunction with first vespers of the First Sunday of Advent. Members of HELP attended this Saturday, 5pm Mass to begin, as the Holy Father stated, “The time of preparation for Holy Christmas a propitious moment to invoke divine protection for every human being called into existence, and also for a thanksgiving to God for the gift of life received from our parents." Fortified by reconciliation and Mass at St. Andrew's Benedictine Abbey, 17 members of HELP joined other greater Cleveland area residents on November 6th to provide a pro-life presence infront of a Shaker Heights abortuary - Abortion Access. These hardy souls, weathered the bitter cold and a driving rain storm indicative of the onset of winter weather in northeast Ohio as they prayed the rosary and Divine Mercy chaplet. At Fatima in 1917, Our Lady made it clear that the Rosary is the supernatural solution to our earthly problems. 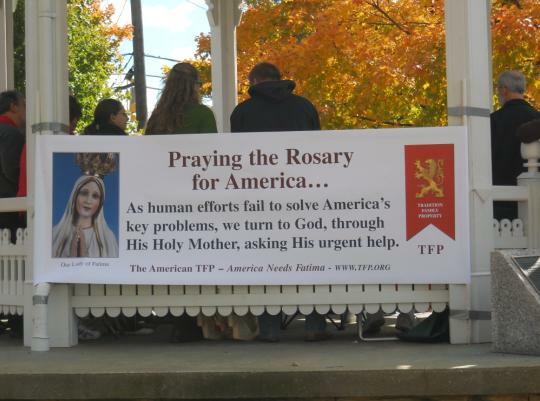 In “The Secret of the Rosary”, Saint Louis de Montfort states: “Public prayer is far more powerful than private prayer to appease the anger of God and call down His Mercy and Holy Mother Church, guided by the Holy Spirit, has always advocated public prayer in times of public tragedy and suffering.” Joining over 5300 other “America Needs Fatima” gatherings across the nation, on Saturday, October 16, in the Gazebo on the square, seventy faithful Catholics from St. Mary and St. Helen gathered to pray the Rosary to counter the secularist offensive to reject God and the prevalent disdain of His wise and loving action as our nation refuses His grace upon our citizens. 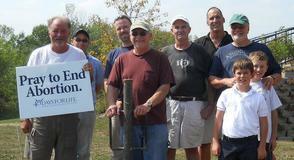 HELP volunteers moved the memorial to the Doers of the Word Baptist Church on Rte 87 in Newbury on October 25th. 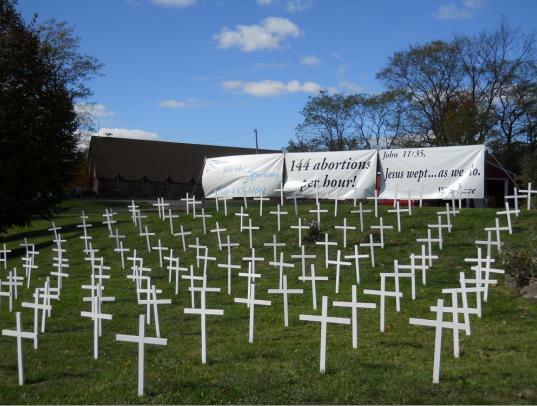 This is the second year that this pro-life church has hosted the display on their front grounds reminding people driving by of the 144 babies destroyed every hour of every day for the last thirty-seven years since the Roe v Wade decision. 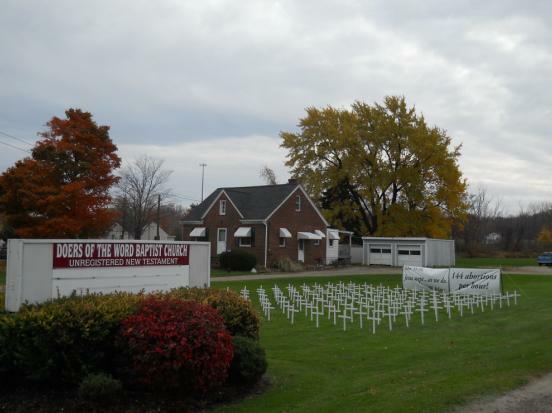 The 144 white crosses moved on October 11th from St. Lucy in Middlefield, to the grounds of the third member of our cluster, St. Edward Church in Parkman, OH. The display, along with the accompanying three signs, is located on the corner of Center Street and Rt. 528. 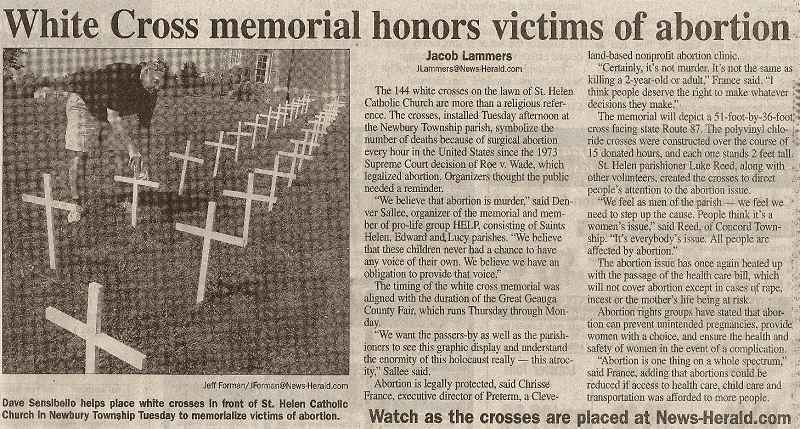 People going by the Memorial Cross display are reminded of the tremendous loss of life that has occurred in our nation every hour of every day since Roe v Wade took effect. For visitors to Texas, the list of things to do is virtually never-ending. From nature centers to indoor museums, from theme parks to festivals, there is always something to see and do during a Texas vacation. It is usually hard to fit everything into your days' schedule. But for these two longtime pro-life advocates, finding time to participate in the 40 Days for Life Campaign in Austin was a priority. Bill & Clare you are a real inspiration to us! On the afternoon of Tuesday, August 31st, volunteers of the pro-life apostolate, HELP, endured the blazing heat to once again install the white cross display on the front lawn of St. Helen Roman Catholic Church. The white crosses represent the 144 babies that lose their lives to abortionists each hour of each day since the Roe vs Wade decision. The memorial is a visual reminder of the ongoing horror in America by which we murder 144 innocent children in their mother’s wombs each hour of each day. 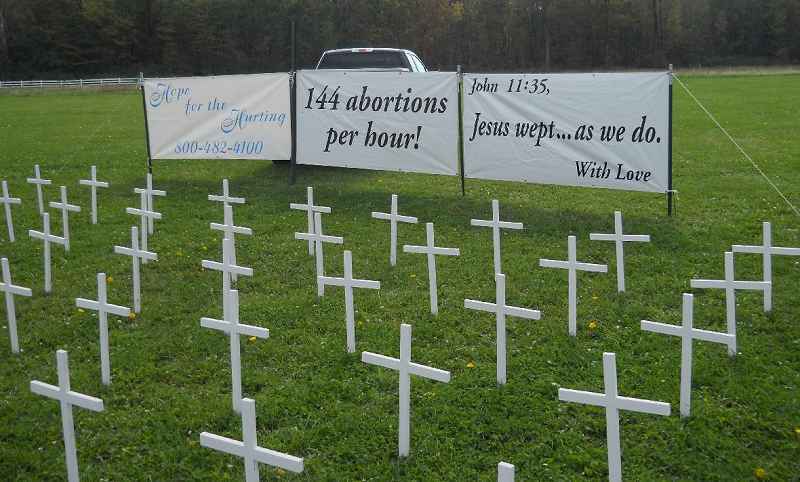 Three signs accompany the crosses to further emphasize the message of life and healing to all who walk by the display. One of the signs has contact information for the Bethesda Healing Ministry for post-abortion help for those who are hurting. Another reinforces the number of surgical abortion deaths. The third sign quotes John 11:35, “Jesus wept”, the shortest verse in the Bible with the added statement that captures the sentiment of the HELP organization”… as we do. With love." At Preterm, the death clinic in Shaker Heights, Ohio that exterminated 5,432 children and took in $1,944,692 for their “medical services” for the fiscal year ending June 2009, a group of five from HELP gathered to pray in the early Tuesday morning rain. 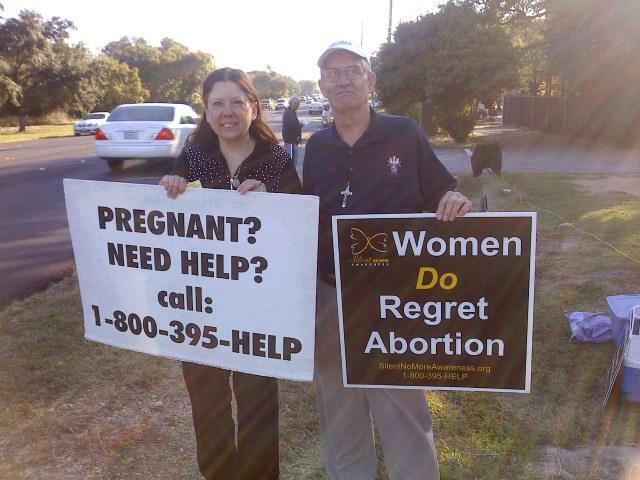 As some members offered referrals for assistance and a variety of support to the arriving mothers if only they would reconsider their tragic decision, others held the 40 Days for Life signs, spread out along the sidewalk and prayed silently for a "save". The nasty weather and knowing the tragedy that was taking place only yards behind us made the scene especially depressing. The usual and constant prayers were offered asking the Father for an end to the evil of abortion and for a conversion of heart for all who are involved in abortion. This morning a special and specific prayer was offered up. We prayed in the name of Jesus His Son that, if it were the will of the Father, He send us a “save” that we might share with the multitudes of His people who were similarly involved in prayer across the nation and around world. When our time was almost over, a member offered the “Help Is Available” literature to a departing woman. The woman took the literature and told us that she had an appointment to abort her baby this morning but had changed her mind. When asked, “What made her change her mind?, she answered, “God did.” We blessed her and encouraged her to utilize the assistance being offered. We told her that we would be offering prayers of thanksgiving for her courage and of support for her as she carries her baby to term. Her name is Mercedes. Please pray for her. As a 40 Days coordinator in another city stated so well, ”We do what God asks and He provides the miracles!” Thank you, Lord, for sending us this miracle to uplift and encourage us as follow your call to us to speak for the unborn. On Thursday September 30th, five seminarians from St. Mary's Seminary in Wickliffe, OH joined members of HELP in installing the 144 White Cross Memorial at the Servants of Mary Center for Peace in Windsor, OH. Once again the crosses will be placed infront of the illuminated rosary circling the reflecting pond before the 50-foot statue of Our Lady of Guadalupe. Thanks to the hard work and sacrifice by members of the HELP Pro-Life Ministry a vision first conceived months ago came alive on September 2nd. 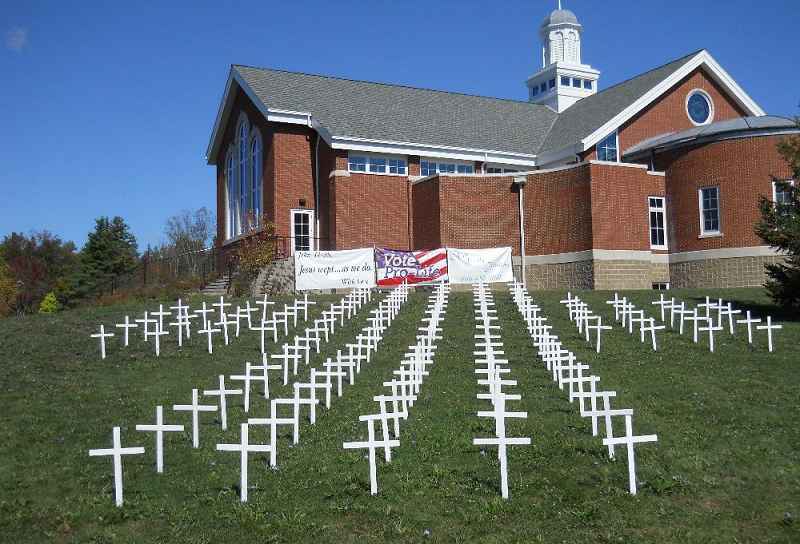 That idea, to display white crosses on the front lawn of St. Helen Church Newbury, OH as a visual reminder of the ongoing horror in America by which we murder 144 innocent children in their mother’s wombs each hour of each day, came to fruition during a beautiful and solemn Prayer Service led by Deacon Larry Somrack, Pastoral Associate of St. Helen’s Roman Catholic Church in Newbury. The service began in the Church with an opening prayer seeking the intercession of Our Blessed Mother and followed by singing The Litany of the Blessed Virgin Mary. The crowd which numbered about 250 exited the church and carried the crosses through the garden pathway adjacent to the church to the hill overlooking the front lawn. As each Glorious Mystery of the Rosary was announced, Fourth Degree members of the Knights of Columbus raised their swords. The Rosary was led by three members of HELP and two Knights of Columbus. At the conclusion of each Hail Mary, three crosses were handed to members of HELP who placed the crosses on pre-installed posts. After the Rosary, General Intercessions were sung followed by a Blessing and Dismissal by Deacon Somrack.